DePaul University is likely to announce the name of its stadium soon, the school's student newspaper reported. CHICAGO — DePaul University is shopping the right to name its future basketball arena near McCormick Place, and it won't come cheap. The company that gets to attach its name to the $164 million statdium, which is expected to be completed by next year, will pay the university about $34 million. The DePaulia student newspaper reported this week that an announcement on the naming rights could be coming soon, and activists have renewed their call that some of that money to be diverted to Chicago Public Schools. Erika Wozniak, a DePaul alumna and award-winning CPS teacher, launched a petition in 2015 calling for the university to donate the revenue to the cash-strapped school district. The effort earned the full-throated support of former Blaine Elementary School principal and outspoken political activist Troy LaRaviere. "As Chicago taxpayers are helping to fund this stadium, we ask, in the spirit of St. Vincent DePaul, that the university steps up and gives back to the deserving students of Chicago Public Schools," the petition reads. When the plan for the stadium and adjoining hotel was made public in 2013, less than a week before the Chicago Board of Education voted to close 49 elementary schools around the city, city leaders faced a formidable public backlash for incorporating tax increment financing into its budget. TIF dollars are funneled from city property taxes, which are typically spent on CPS and other public services. 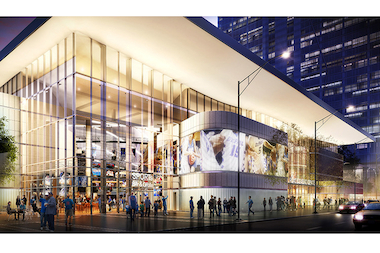 Planners agreed to strip TIF funding from the arena — partially in response to an earlier petition Wozniak circulated in 2013 — but the adjacent Marriott Hotel will still soak up $55 million from the public fund. "They shifted the money around, but it's disingenuous to say DePaul is no longer benefiting from that money," Wozniak told DNAinfo Monday. "So I thought, if they're benefiting from $55 million in public tax dollars, why not ask them for something in return?" There's no end in sight to the CPS budget crisis, with more cuts and teacher layoffs announced over the summer. "As a teacher, I know how beneficial $1,000 can be, let alone a million," Wozniak said. "These naming rights could pay for a lot of necessary services that have been cut, like elementary school sports programs or special education." A spokesman for DePaul's basketball program did not respond to a request for comment Monday.